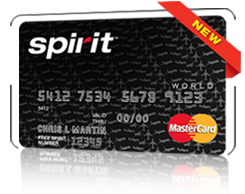 If you can get past the fact the Spirit Airlines was the first major airline to start charging for baggage on flights, then you will see that with their recent switch from Barclaycard to Bank of America as the issuing bank, Spirit has great improved there Spirit World MasterCard®. APR for the World MasterCard is 15.24% and the APR for the Platinum Plus version is 18.24%. Overall this credit card is a nice looking airline card. It remains to be seen how customers will feel about it, but I think as Spirit continues to grow, this is an offer to keep an eye on. Its going to be hard not too. If you have been to their site lately, have you seen this pop-up?